The Mordecai Community of Raleigh is on the northeast corner of town, just outside the downtown area. Nearby neighborhoods include Oakwood, the city's oldest surviving neighborhood, and Brooklyn, off Glenwood Avenue. Understanding the history of the neighborhood requires going back to 1785, when Joel Lane built a house for his son Henry. Joel Lane, a noted patriot during the Revolutionary War, served as senator for Wake County 10 times in succession. In 1792, he sold 1,000 acres of land to the state (for 1,378 pounds) to found the capital city. An interesting sidenote to this story is the fact that the commission appointed to select a site for the new capital was leaning toward land owned by Colonel John Hinton across the Neuse River. The night before the final vote, the committee adjourned to Lane's home (a social center of early Wake County) for an evening of food and spirits. The next day, the vote came out in favor of Lane's land. Joel Lane built what is now Mordecai House for his son Henry. Henry's daughter Margaret married Moses Mordecai, a Raleigh lawyer and judge, and with him had three children. After Margaret's death, Moses married her sister, Ann Lane and had another child. Mordecai died in 1824 and provided in his will for the enlargement of the house, which was done in 1826. While Mordecai now feels like it's almost downtown, it was once outside the city limits. The plantation produced everything from food to medicinal plants. A variety of herbs were grown in the plantation garden. Locals turned to Harriet Lane for medicinal salves. A major fixture in the area was Pilot Mills, a large cotton mill established in 1892. Workers lived in the adjoining Mill Hill, a neighborhood of 68 homes owned by the mill. The mill closed in 1982, and a few years later, the Mill Hill neighborhood was demolished. The mill buildings themselves have been completely renovated and are leased to a number of tenants including Alien Skin Software and Raleigh Charter High School. Construction began in 2001 on The Village at Pilot Mill, a neighborhood built on the street layout of the original mill village. This development of approximately 100 homes has a decidedly urban feel, with closely spaced lots and alleyways. During its heyday, Mill Hill wasn't truly considered to be part of Mordecai, but the boundaries of the neighborhood have become somewhat fuzzy over the years, and today, Mordecai embraces the Pilot Mills as its own. The Mordecai house was originally on the outskirts of Raleigh, but in 1907, the General Assembly voted to extend the city's borders, bringing the plantation into the city limits. Development of Mordecai Place began in 1922. Maps were drawn by William B. Brandy and Harry Tucker. 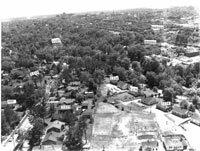 It's a bit hard to imagine it now, but at a time when many Raleigh residents lived in a fairly densely populated downtown, Mordecai Place was truly a suburban neighborhood. 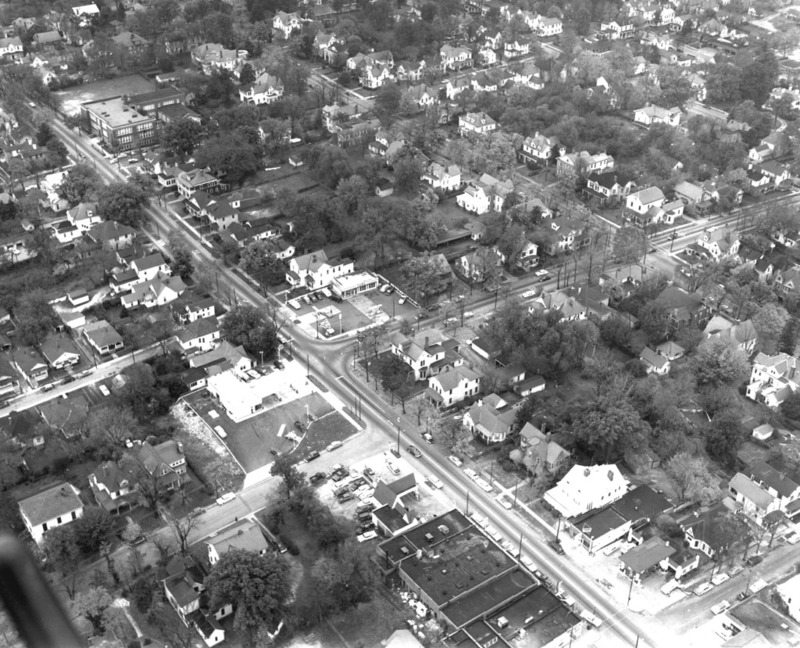 Just as some concerned citizens today are fighting suburban sprawl, there were outspoken opponents to the development of neighborhoods like Mordecai Place. In 1940, the city erected Halifax Court, a large public housing project, to the north of Peace College. In that time of segregation, Halifax Court was built for the city's poor white residents. Over time, Halifax Court fell into disrepair. The Raleigh Housing Authority was awarded a HOPE VI grant to replace Halifax Court with a lower density mixed-income neighborhood. Halifax Court was demolished in 2000 and replaced with Capitol Park, a mixed income neighborhood of townhomes. Mordecai Place Historic District was listed on the National Register of Historic Places on February 4, 1998. The Historic District is roughly bounded by North Blount Street, Courtland Drive, Old Wake Forest Road, and Mordecai Drive. In the early 21st century, the Mordecai area is undergoing a revival of sorts. With downtown Raleigh springing back to life, the older urban neighborhoods are back in vogue. Homes are being restored and businesses are moving into the area. The future of Mordecai looks bright.